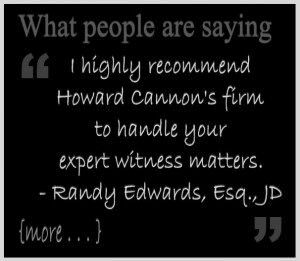 Restaurant Expert Witness Howard Cannon is the nation’s premiere Hospitality Industry Forensic Expert. The hospitality industry, includes restaurants, bars, hotels, and other types of businesses. Also has an alarmingly high rate of injuries, food borne illnesses, wrongful deaths, rapes, murders and all kinds of other grisly incidents. Whenever your law firm takes on a hospitality industry related case, Restaurant Expert Witness should be your first call. Howard has over 200 litigation cases and 300+ pre-litigation matters in State and Federal courts under his belt. We don’t charge for travel, and our services are offered nationwide. The next time that you find yourself in need of a hospitality expert witness, give us a call for a free no-obligation consultation.